Rain and a possible thunderstorm expected before 3 p.m. Grab an umbrella -- scattered showers are expected to move across the Chicago area through Tuesday evening before more rain later this week. Early models show rain and a possible thunderstorm before 3 p.m. followed by scattered showers and more chances for thunderstorms later in the afternoon, according to the National Weather Service. The NWS reports the area's chance of precipitation is 80 percent with new rainfall amounts predicted between a tenth and quarter of an inch, or higher if storms break. 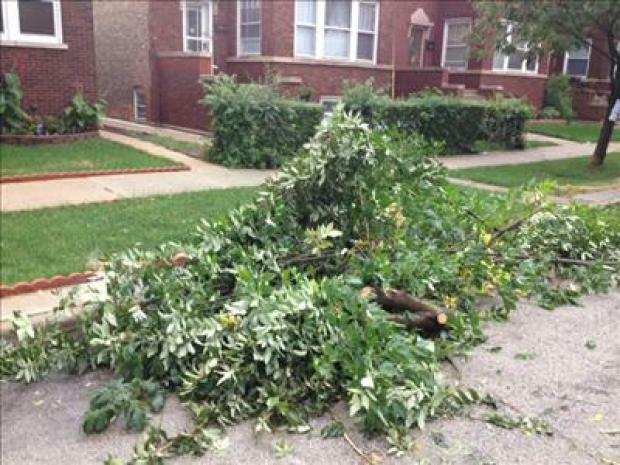 Severe weather is not anticipated, the weather service said, but a few gusty storms are possible in far northeast Illinois and northwest Indiana. Temperatures stay mild with a high near 67 degrees, then drop into less seasonable ranges after today's rainfall. Showers wrap up Tuesday night, drying out the area Wednesday morning until another wave of showers move in after 1 p.m. The day otherwise looks mostly cloudy with a high near 57 degrees and gusty southwest winds. The next chance for rain comes Thursday with a 20 percent chance of showers, according to the NWS. There's another chance for rain Saturday, but the weekend mostly looks partly sunny with a cool high in the mid-50s.